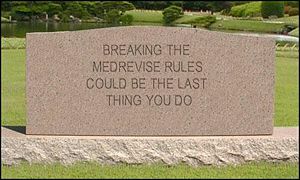 This is the basis of MedRevise. To edit pages, you have to agree to follow these guidelines, and conform to our philosophy. They are not iron rules, but try to conform to the spirit of the site. There's a nice mnemonic to it too - CAB TRIPS! Has to be in the format Capital letter for first word small for rest. Or Immune disorders and Ear nose and eyes. Don’t call a page Lots Of Capital Letters unless necessary. If a page title is wrong, rename the page rather than creating a page redirect. Try to use paragraphs rather than bullet points. Lists of bullet points are not interesting for anyone, and instantly forgettable. Go to the templates page before just making a page from your own meandering ideas. If there is a ready made template use that, or try to adapt one. Try to avoid making pointless empty redirect pages. For example; ENT is a usefull redirect page, as it might be used quite a lot. Stuff going wrong with your nose and things would be better as a hidden link [[ENT|Stuff going wrong with your nose and things]]. This will reduce the number of extra pages in the database and make it faster. Don’t use too much extra information. Each clinical condition needs basic information, but you don’t need to know which protein pathway the pathogen disrupts in the inter-cellular membrane. Put stuff like that in Wikipedia. Keep it relevant. This site is aimed at F1s and Med Students. Not specialists. There are hundreds of variations of congenital heart defects. We’ve got 8. Especially in microbiology try to avoid too much extra information. If a page is quite full of information, add a picture. It doesn’t need to be done, nor does it need to be relevant – it just makes things easier on the eye, and more fun to read. You may notice, there are a lot of stupid pictures. Revision is a dull process. Always throw in a knock knock joke if you feel like it, since it will break up the intensity a little. This page was last modified on 5 April 2013, at 07:26.